Go green! 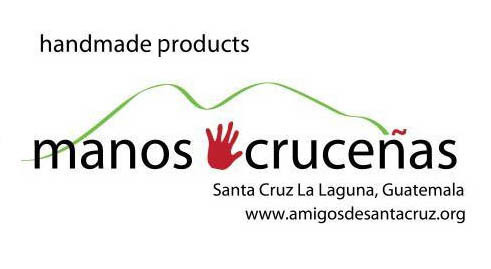 The blue Amigos Bag is a convenient and stylish way to go shopping and travel! Just the thing when you need that extra bag. 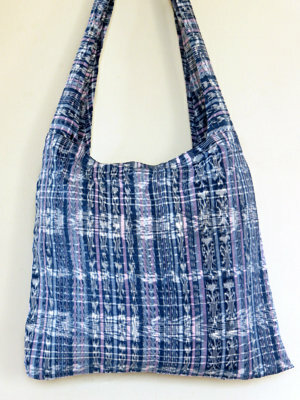 Made from upcycled jaspe* fabric, the bag measures 17" x 15" with a 30" strap. This tote easily folds into it's own draw-string sack which is conveniently attached to the inside of the bag so you will never lose it. Pop it into your purse, keep it in your car, throw it in your suitcase. It is always there for you! The blue jaspe is predominantly dark blue with white. May include threads of other colors in lesser amounts. These are only a sampling of the array of jaspe fabrics. Due to the vast number of variations in jaspe fabrics available, please choose your basic color palette preference and allow us to choose the fabric. *Jaspe (pronounced “haspeh”) is a traditional Guatemalan cotton/cotton-blend/rayon textile that is woven on a peddle-loom. The fabric is traditionally used for women’s skirts. Jaspe patterns are created by a series of faint stripes formed by the arrangement of light, medium, and dark warp threads or by twisting together 2 threads of different colors. The fabric often has ikat designs. Our upcycled fabrics will not run or bleed in the wash.